I was scrolling through posts in a Facebook group for female travelers the other day, when I came across one posted by a woman who was headed to the Scottish Highlands and looking for suggestions for places to stay. Her only requirement, other than being in the Highlands? “Maybe somewhere where I could meet someone like Jamie from Outlander,” she wrote. It’s okay if that made you chuckle – it made me chuckle, too. But it also illustrates the phenomenon that the Outlander series has become. Outlander, in case you’re not familiar with it, is a series of books written by Diana Gabaldon that’s now being made into a hit TV series. The books start out with WWII-era nurse Claire Randall traveling backwards through time via standing stones to Scotland in the mid-1700s, where she marries and falls in love with Highlander Jamie Fraser. Diana Galbaldon’s books have been popular for decades, and now the Outlander fan base is only growing as the TV adaptation of the books gains popularity around the world. And while the actors who play Jamie and Claire in the series are no doubt integral to the story, the REAL star of Outlander is the country of Scotland. Scotland features prominently in the first couple Outlander books, and even later in the story when history takes Claire and Jamie across the ocean to the New World, the TV production is still largely filming in Scotland. Which is probably why Visit Scotland is declaring Outlander “the new ‘Braveheart’ of tourism.” According to research Scotland has conducted recently, visitors are mentioning Outlander more frequently than any other movie or TV show when it comes to their inspiration for visiting Scotland. And visitor numbers are up at Outlander filming locations, too. 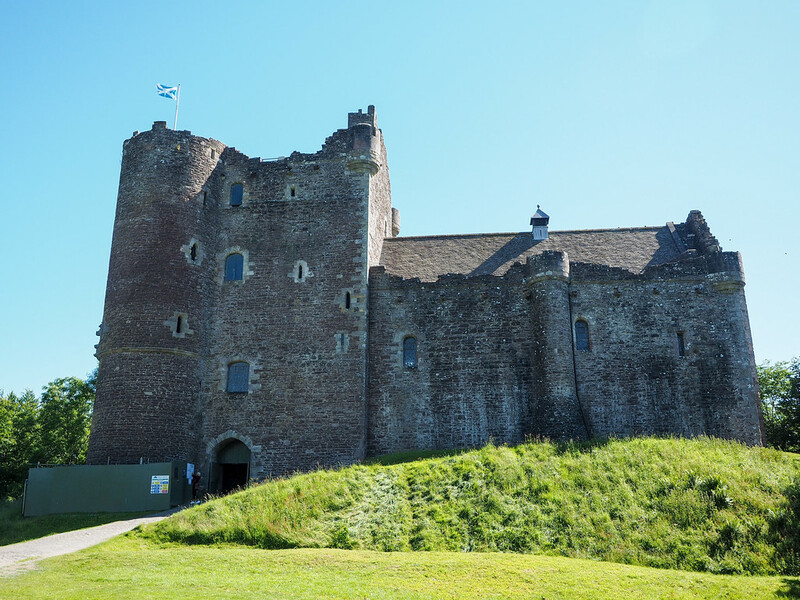 For example, between 2014 (when the TV show first aired in the USA) and 2016, visitors to Doune Castle (which is Castle Leoch in the show) increased by 91.8%. That’s kind of insane! But not really surprising, considering how vast and passionate the Outlander fandom is. 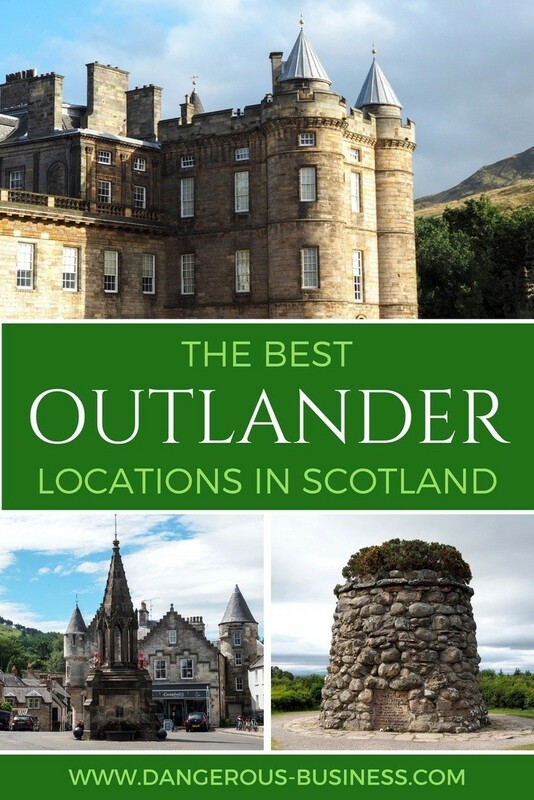 If you’re planning a trip to Scotland anytime soon and are interested in seeing some Outlander-related sites, I’ve put together a huge list of places that you’ll want to check out. There are A LOT of Outlander-related sites to see in Scotland. This is because, while the story and characters are fictional, the events that take place in the story (like the Jacobite rebellion) were real historical events. Add in books AND a TV show, and you’ve got a plethora of places you can visit that are featured in some way, shape, or form. Below you can find the Outlander locations in Scotland that I think are the most notable, recognizable, and important to actual history. 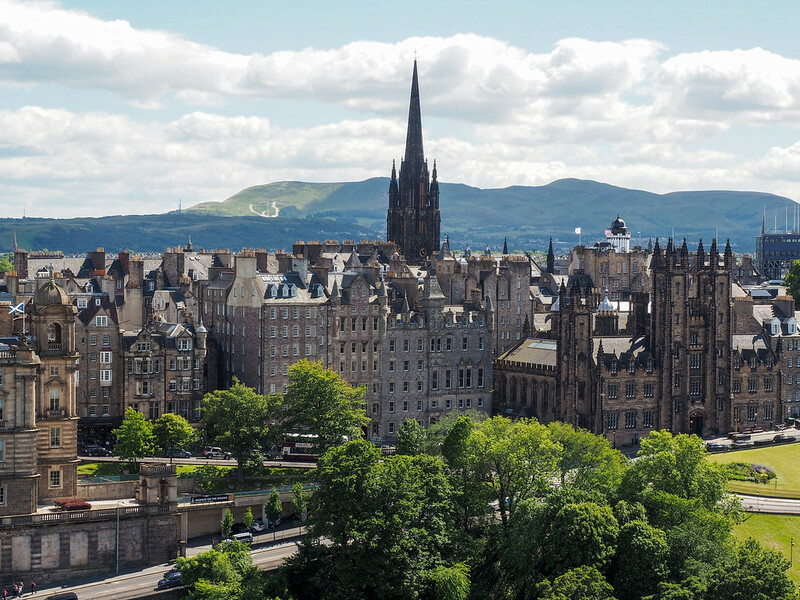 Chances are that your Outlander exploration is going to begin in Edinburgh, Scotland’s capital. Which is perfect, because there are several attractions in the city that are related either to Jamie and Claire’s story, or to actual historical events covered in Outlander. 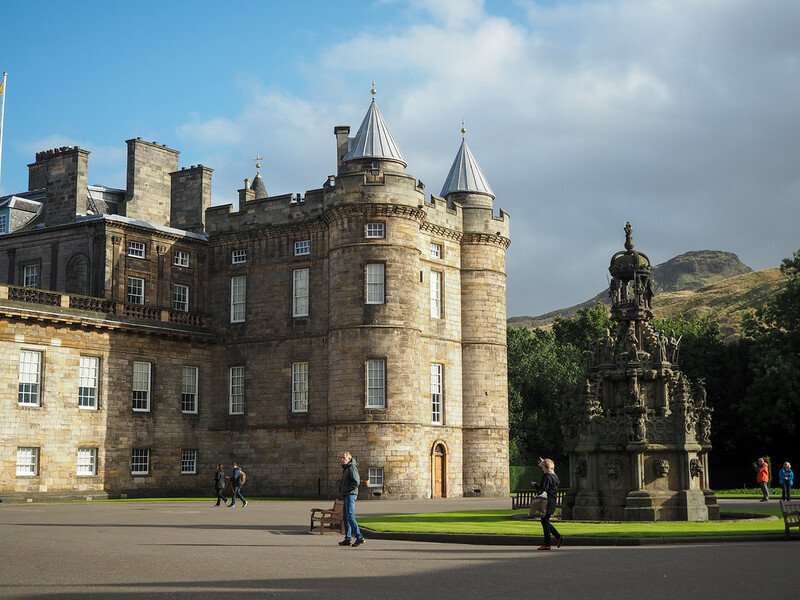 The top spot in Edinburgh for any Outlander fan to visit is probably the Palace of Holyroodhouse. This palace at the bottom of the Royal Mile is the official residence of the British monarch in Scotland (the Queen does in fact come and stay here every summer), and before that was the main residence of the Kings and Queens of Scotland. The palace dates back to the 1500s, and you can still visit the historic apartments of Mary Queen of Scots (my favorite part of visiting!) along with the State Apartments and rooms the Queen still uses for entertaining. No photos are allowed inside the palace. Of interest to Outlander fans is the fact that Bonnie Prince Charlie used Holyrood as his base for more than a month in the autumn of 1945, after his Jacobite troops took Edinburgh. This is reflected in the Outlander story, when Jamie and Claire stay here, too, and attend the prince’s lavish parties in the Gallery. 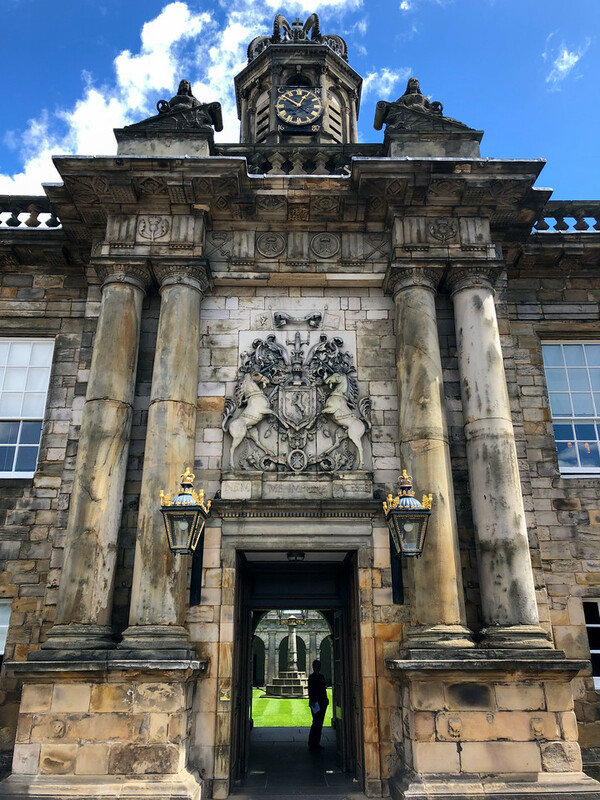 You can visit the Gallery on your tour of the palace – and be sure to listen to this section of the audio tour, where you’ll learn about how government troops came in and defaced a lot of the portraits of the Stuarts after the Battle of Falkirk. 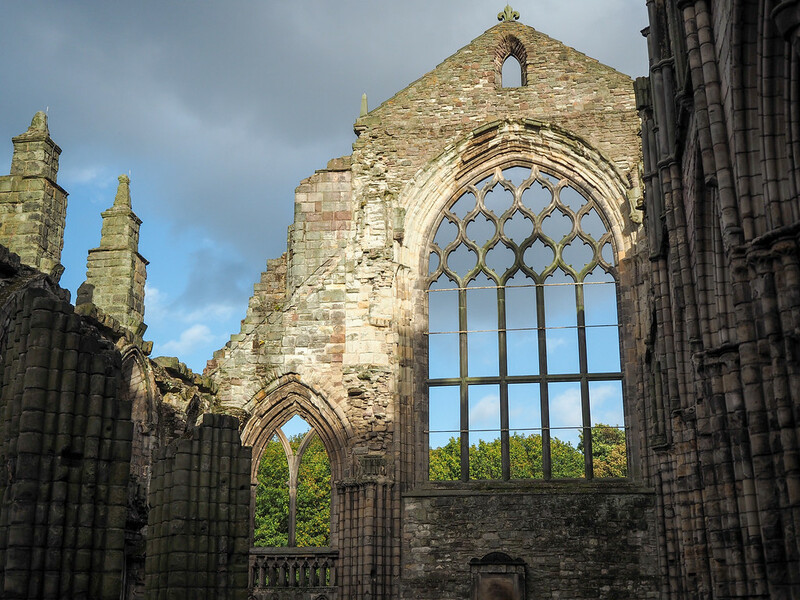 You can also visit the ruins of Holyrood Abbey. Good to know: The Palace of Holyroodhouse is open almost year-round, with the exception of when the Queen is in town. Not far from Edinburgh you can find Midhope Castle – or, rather, the ruins of Midhope Castle, a 16th-century tower house on Hopetoun Estate. 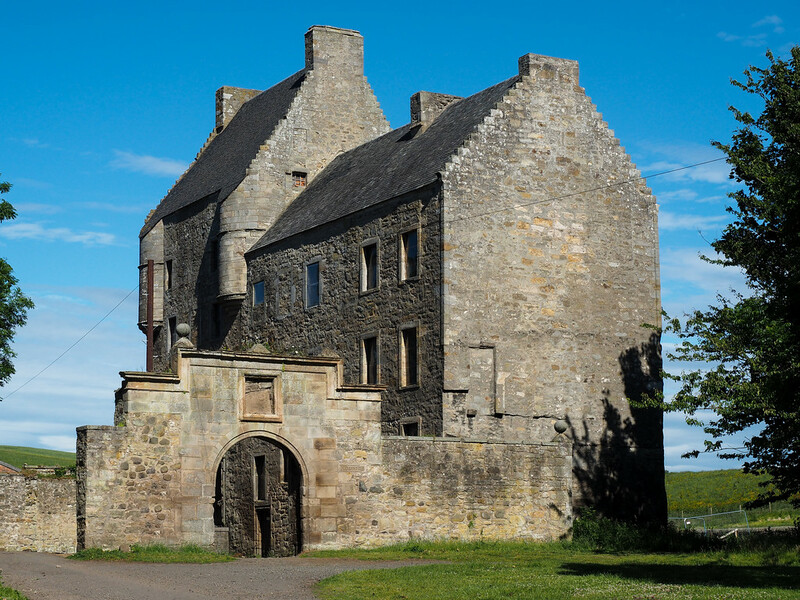 The exterior of Midhope was used as the exterior of Lallybroch, the Fraser family home, in Outlander. You see Black Jack Randall drag Jenny up the steps here, and see Jamie get whipped for the first time in the courtyard. 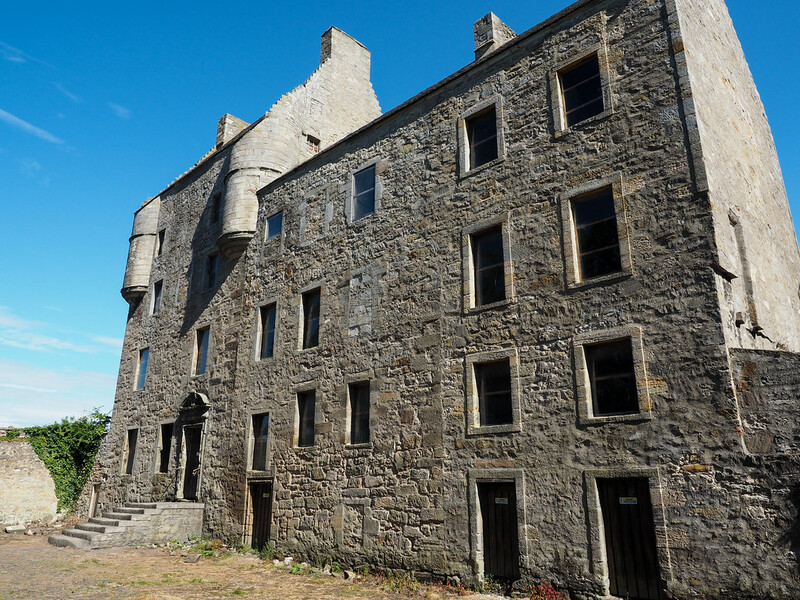 You can’t go inside Midhope Castle as it’s quite derelict and not safe, but there’s no mistaking the building as Lallybroch as soon as you catch sight of it! Good to know: You need to purchase passes in advance from the Hopetoun Farm Shop or the Hopetoun House ticket kiosk. While you’re at the Hopetoun Estate visiting Lallybroch, consider visiting Hopetoun House, too. This sprawling country house was used as the Duke of Sandringham’s estate in Outlander; in Season 1, they filmed a few scenes in the impressive Red Drawing Room. The house and its courtyard were also used for several Paris scenes in Season 2, and as the Helwater stables in Season 3. Good to know: The house is open from Easter until the end of September. Want to get into Outlander? Buy the bestselling books! 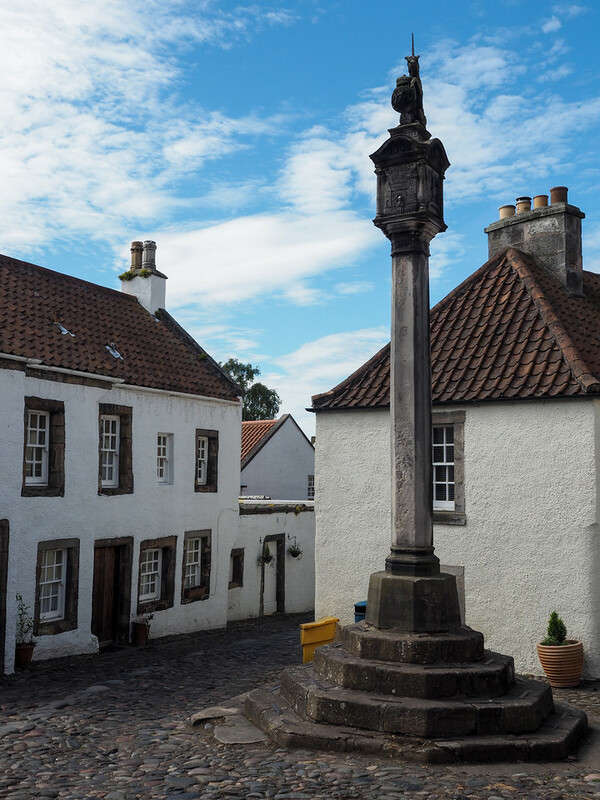 As soon as you set foot in the town of Culross in Fife, you’ll understand exactly why the Outlander team decided to film here: not much had to be done to make it look hundreds of years old. With cobbled streets and little stone cottages, no imagination is necessary to believe you’ve traveled a couple centuries back in time. 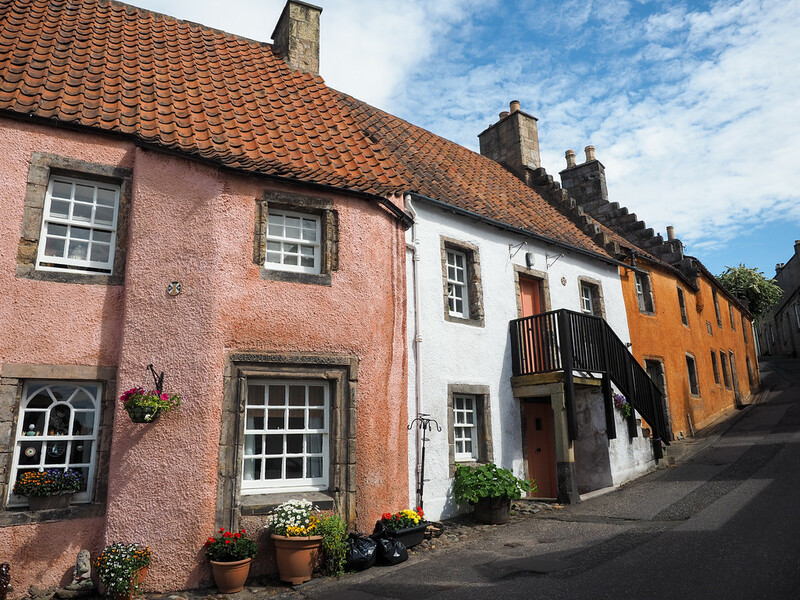 Culross stood in for the town of Cranesmuir in Outlander, the village not far from Castle Leoch. 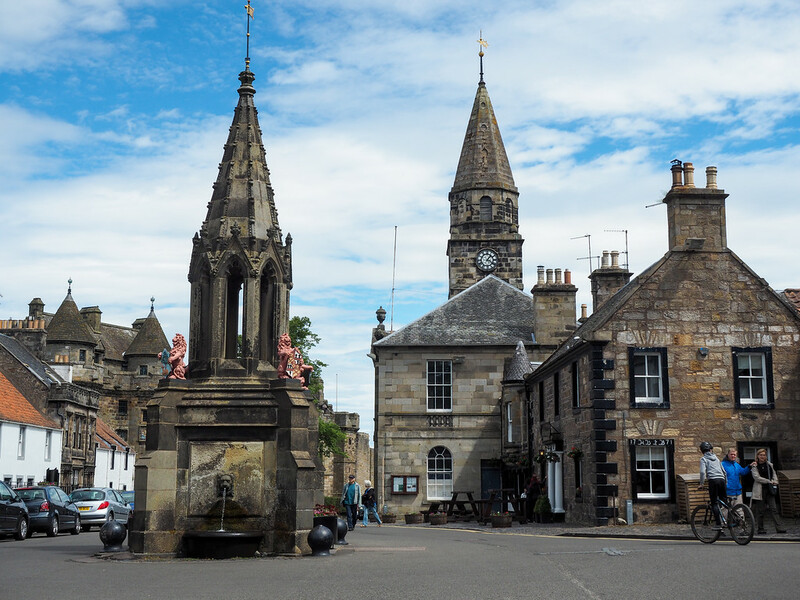 You can see the Mercat Cross near which the little boy had his ear nailed to the pillory in Season 1, as well as the building that would have been Geillis Duncan’s home. The only thing they changed here for filming (other than making sure all the cars and rubbish bins were removed) was to paint the buildings a more period-appropriate grey; everything else was left as-is. 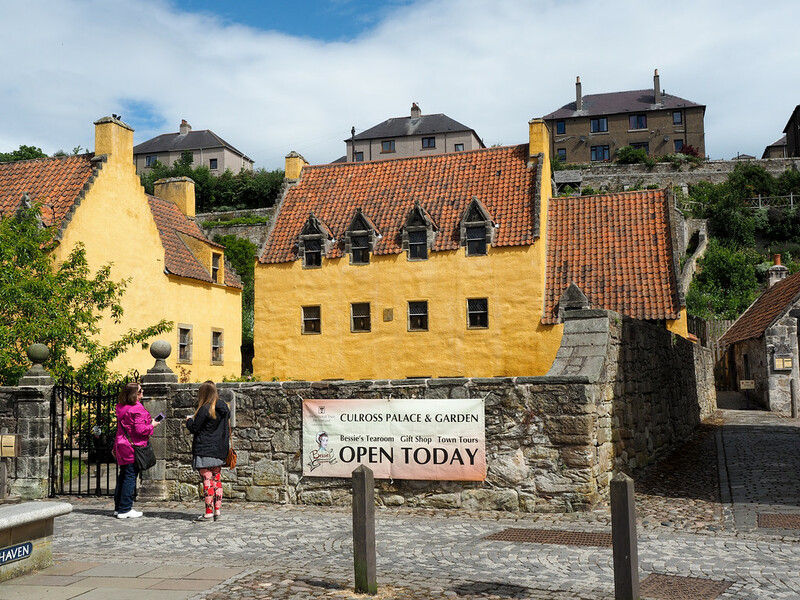 Not far away, you may also want to visit Culross Palace. The gardens here were used as Claire’s herb garden at Castle Leoch, and they also filmed several scenes inside (including, our guide told us, some of Jamie and Claire’s “bedroom scenes”). Another Fife town to visit on your Outlander tour of Scotland is Falkland, which stood in for 1940s Inverness in the TV show. (Why didn’t they just use the actual city of Inverness, you ask? Well, Inverness today is a big, modern city; Falkland is smaller, quieter, and much easier to make look like a town from the 1940s). Here you’ll be able to recognize quite a few things around the Bruce Fountain in Falkland’s town square. 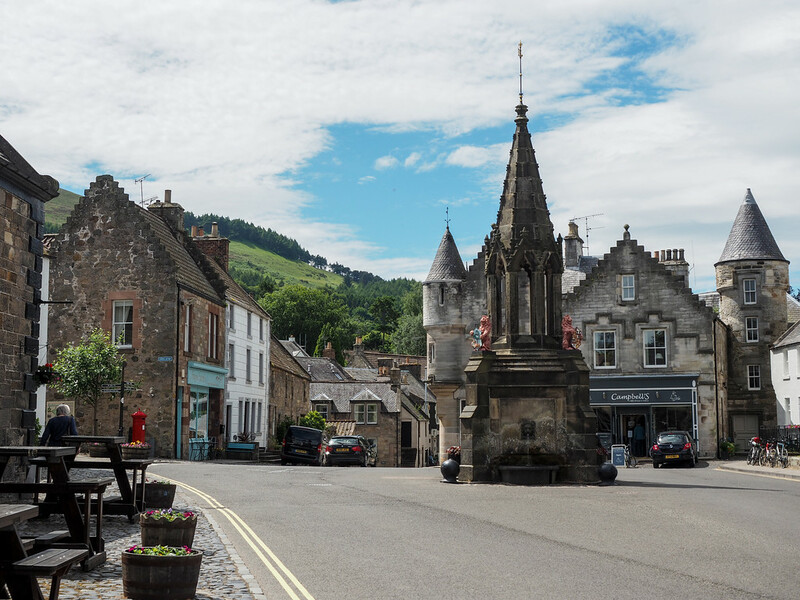 The fountain itself is recognizable as the spot where the mysterious Highlander appears during a storm to peer up at Claire through a window, and said window is also there at the actual hotel (the Covenanter Hotel) that stood in for Mrs. Baird’s B&B. Fountain on the left, Mrs. Baird’s on the far right. 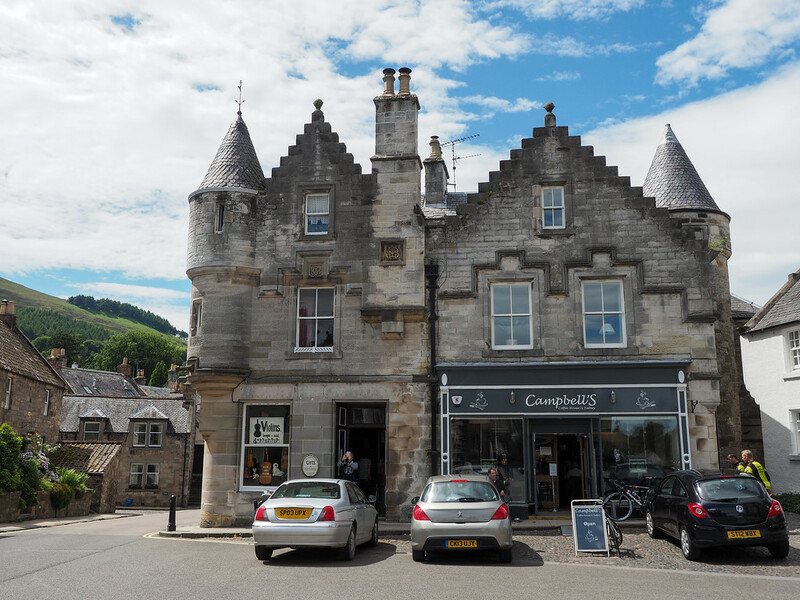 You’ll also see some of the shops Claire walks past, including Campbell’s Coffee House, which was actually turned into a cafe for the filming of Season 1, and has continued to operate as a cafe ever since! 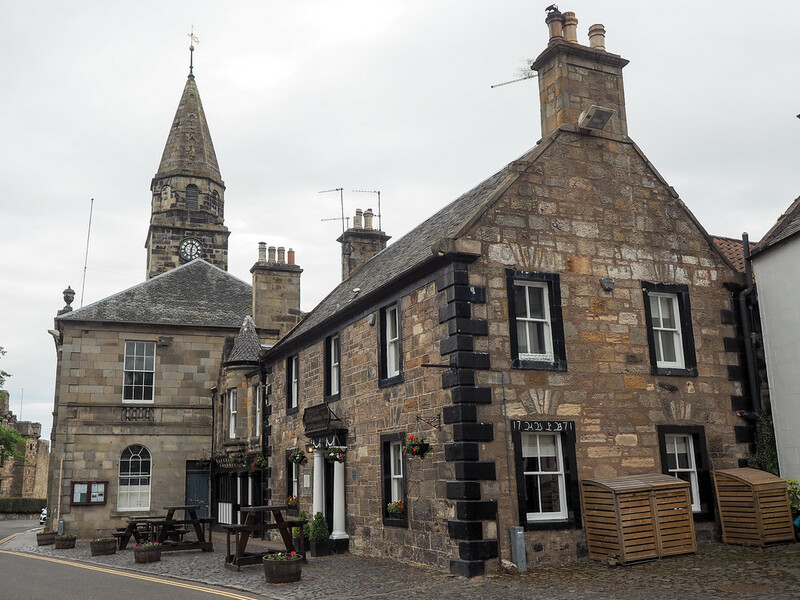 Falkland, like Culross, is a charming little town that feels like it was plucked straight out of a different time period. It’s no wonder they continue to film Outlander here (look out for more of it in the next season!). Cost: Free if you just want to walk around; I can also recommend having lunch at Campbell’s! Do you recognize Castle Leoch? Located in Perthshire, this 14th century castle is no stranger to being filmed. It was featured in Monty Python and the Holy Grail, in Game of Thrones as Winterfell in the series’ pilot episode, and as Castle Leoch in Outlander. This is another one of those locations that you’ll recognize immediately as soon as you see it. 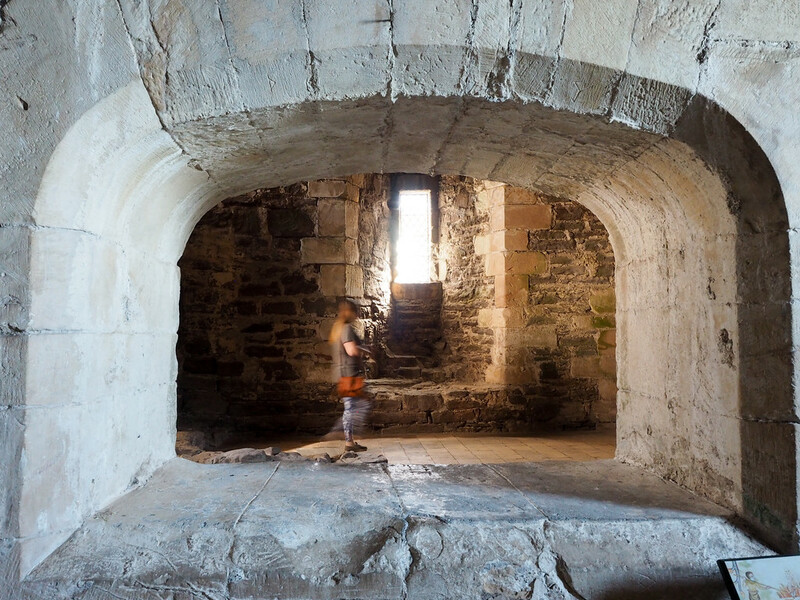 At Doune Castle, you can take an audio tour of the castle that includes its kitchen, huge great hall, battlements, and more. The main historical audio tour is narrated by Monty Python’s Terry Jones, but there are a handful of additional sections narrated by Sam Heughan (AKA Jamie Fraser) that describe what it was like to film Outlander here, too. The great hall, where the “Knights of the Round Table” from Monty Python was filmed. 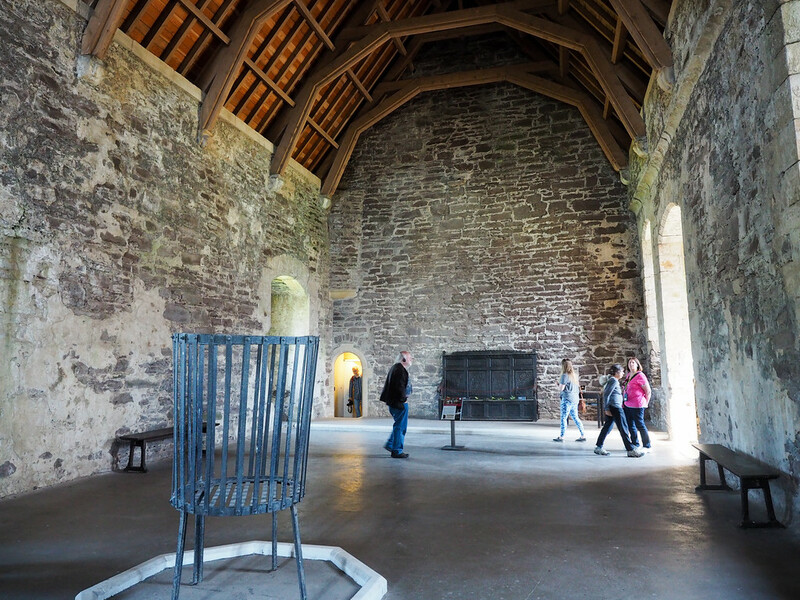 Fun fact: The kitchen at Doune Castle may look extremely familiar as Mrs. Fitz’s kitchen, but they actually didn’t film inside the castle at all. Instead, they built a complete replica of Doune’s kitchen in a studio and filmed the kitchen scenes there. 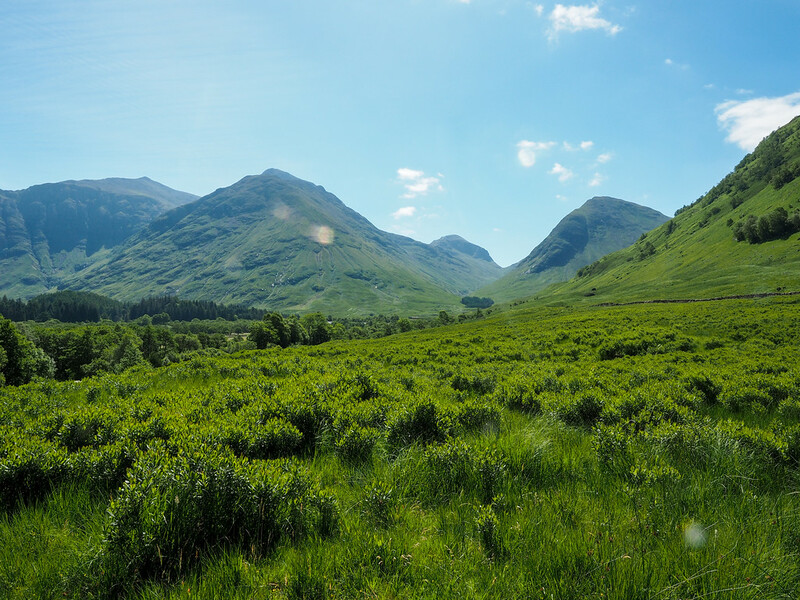 If you’re headed up into the Highlands anyway (which you should be if you’re on the hunt for Outlander filming locations! 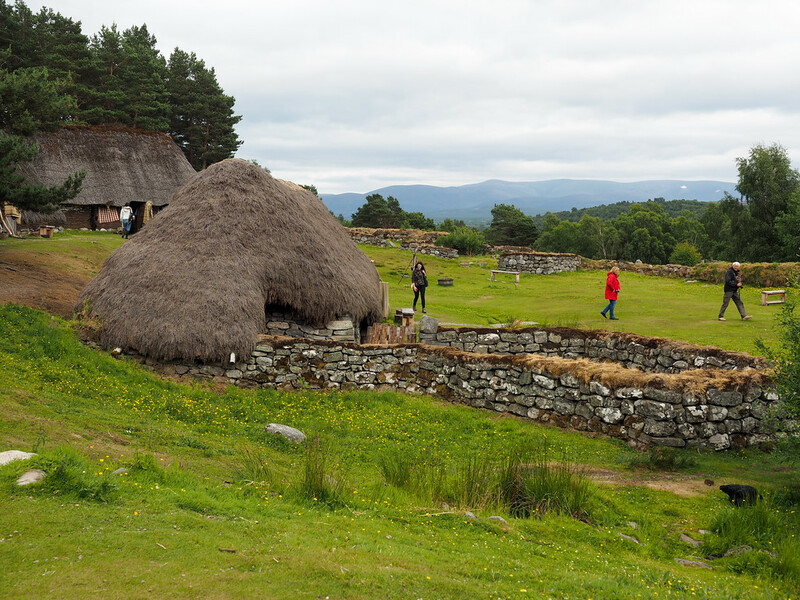 ), make time for a stop at the open-air Highland Folk Museum in Newtonmore. 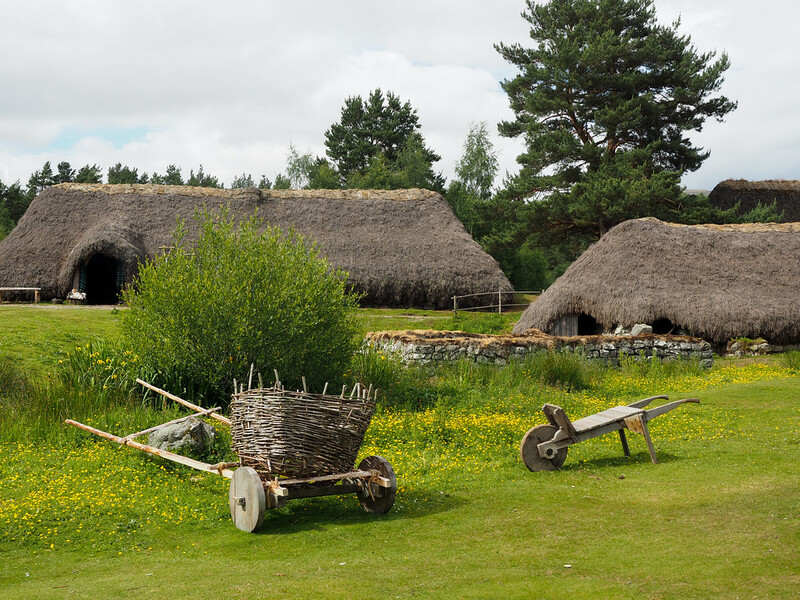 The folk museum has replicas of villages and different aspects of Highland life from the 1700s all the way up to the 1950s. Outlander fans will want to walk out to the 1700s village. Not only does it look the way a Highland village from Jamie’s time would have looked, but this was actually used for filming, too! In Season 1, when Claire goes on the road with Dougal and his MacKenzie men to collect the rents, they stop here and Claire goes off to help some local women work wool. It looks exactly like it did when they filmed here. 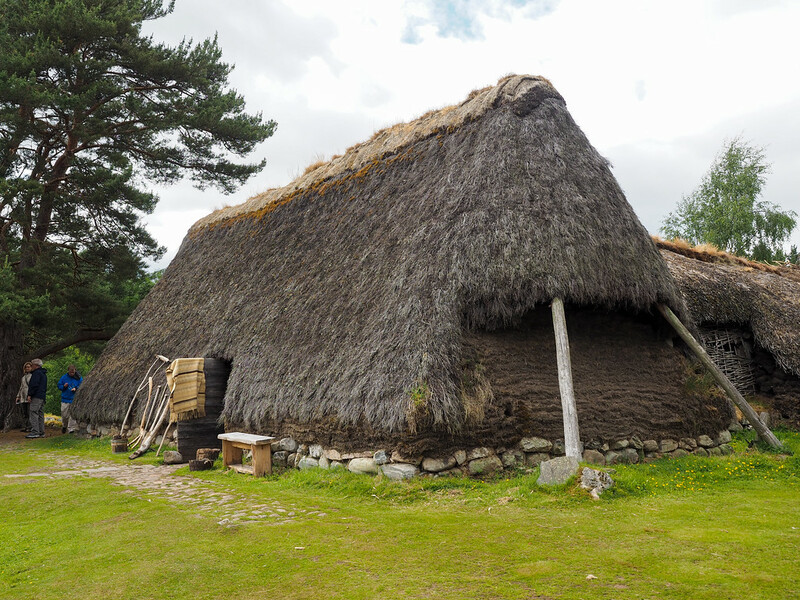 Be sure to go inside some of the thatched cottages and get a good whiff of peat fire! 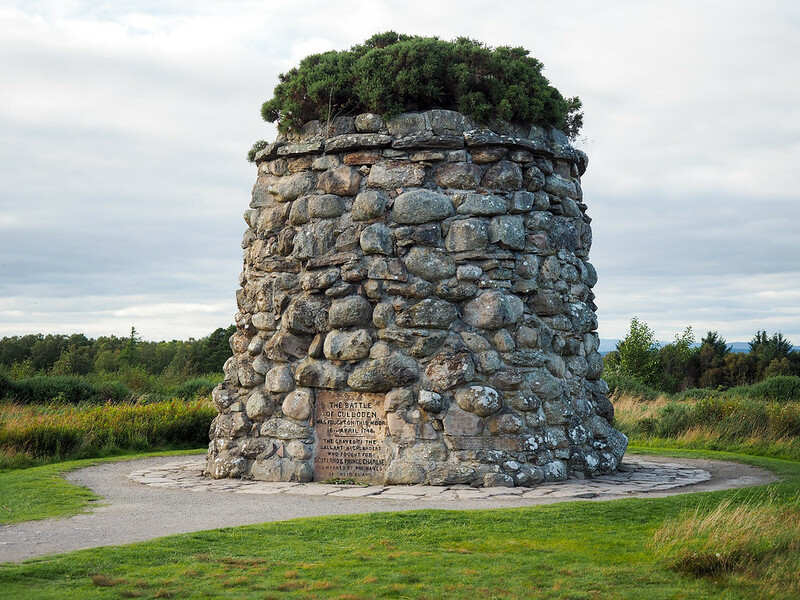 You could say that Culloden is central to the early story of Outlander; it’s the Battle of Culloden that Jamie and Claire spend two whole books trying to avoid/prevent, and which eventually separates them for 20 years across the centuries. And, considering how pivotal the battle was in Scotland’s actual history, it’s a must-visit site for anyone interested in Outlander. It was after this battle (in which Bonnie Prince Charlie’s Jacobite troops were decimated by government troops) that Highlanders were displaced from their land and their traditions (like wearing clan tartan and speaking Gaelic) were made illegal. 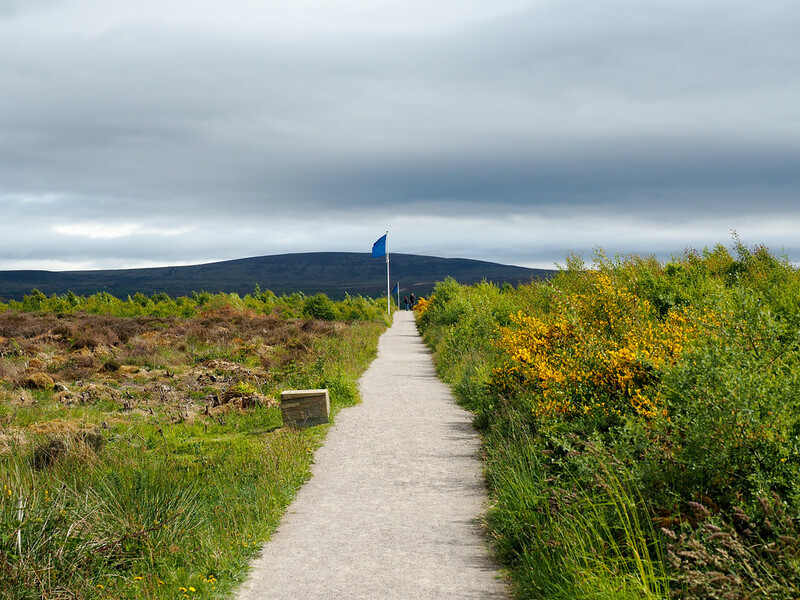 Located not far from Inverness, Culloden today consists of a visitor center and museum that goes into great detail about the Jacobite Uprisings and battle itself, as well as the moor where the 1746 battle took place. I recommend allowing at least an hour to go through the museum first, and then heading outside to walk the battle lines and see the mass clan graves where hundreds of Jacobite soldiers (most of them Highlanders) were buried. They do offer guided battlefield tours several times throughout the day, which are worth joining if you have time. And while snippets from Outlander were indeed filmed here at Culloden, it’s first and foremost a battlefield and gravesite. Be sure to treat it with the proper respect. 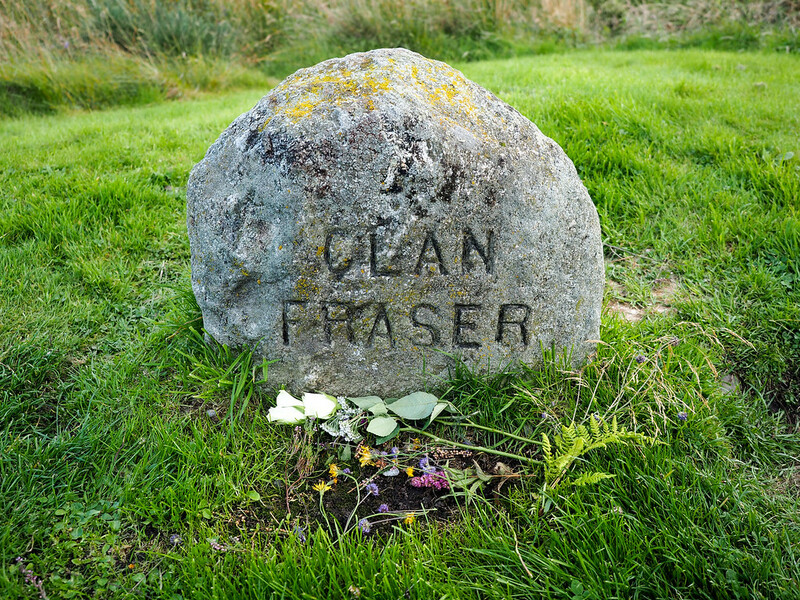 Leaving flowers is okay, but please don’t try to scratch messages to Jamie in the Clan Fraser stone – he won’t see them. 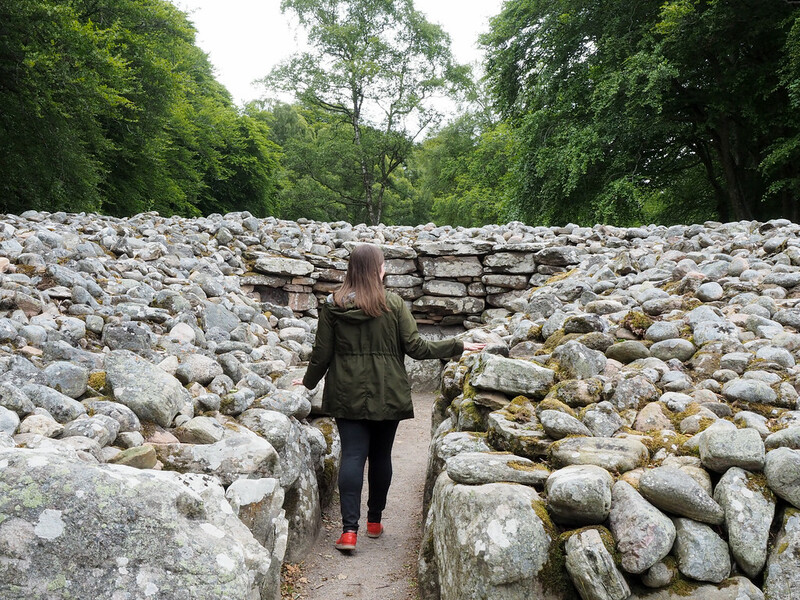 Just down the road from Culloden, you’ll also want to stop to visit Clava Cairns, a collection of standing stones and burial cairns that might make you think of Craigh na Dun, the standing stones Claire uses to travel through time. The bad news is that Craigh na Dun is not a real place, and that the stone circle used for filming was fake. 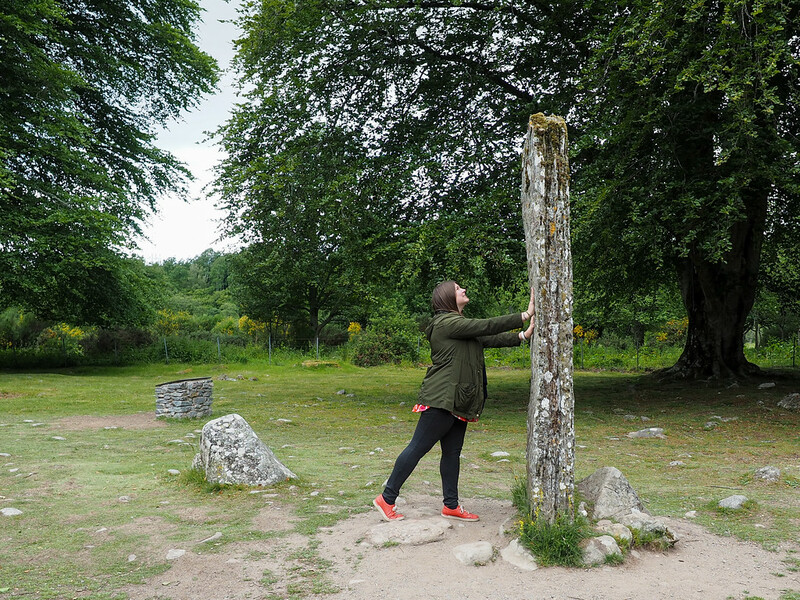 But the good news is that you can still get some great “touching a standing stone and looking for Jamie” photos at Clava Cairns. 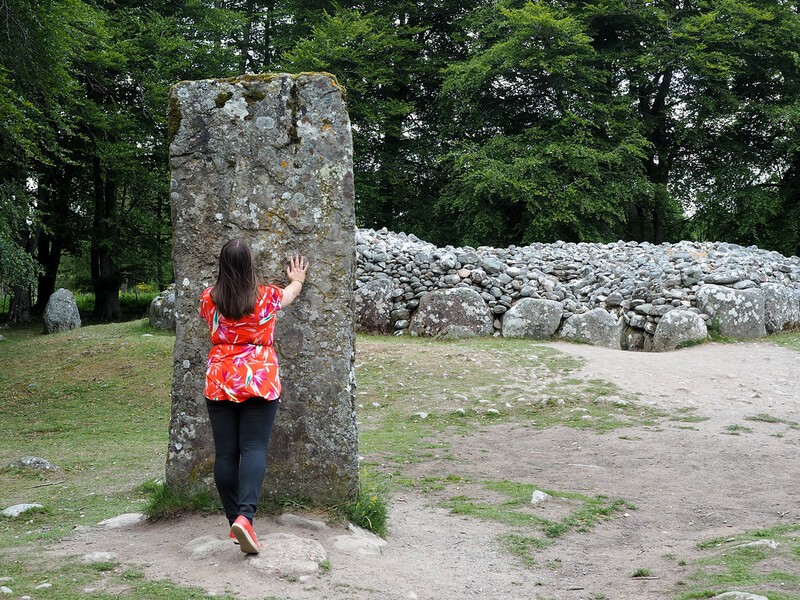 This site dates back to the Bronze Age (about 4000 years ago), and is really cool to visit in its own right – Outlander fandom not required. If you’re creating a DIY tour of Outlander locations in Scotland, you might be interested to know that there are a couple places in Scotland where you can stay and feel even closer to Jamie and Claire. The tour I did with my mom and sister was the 3-day Outlander & The Jacobite Legends Explorer tour with Highland Explorer Tours. Where are my Outlander fans at? Would you want to visit any of these sites in Scotland?